Go back just two years and someone said to me “Women can’t make decent beard care products”. Since then I have reviewed quite a few brands that are female owned and those products have shown that the ladies can often lead the pack! 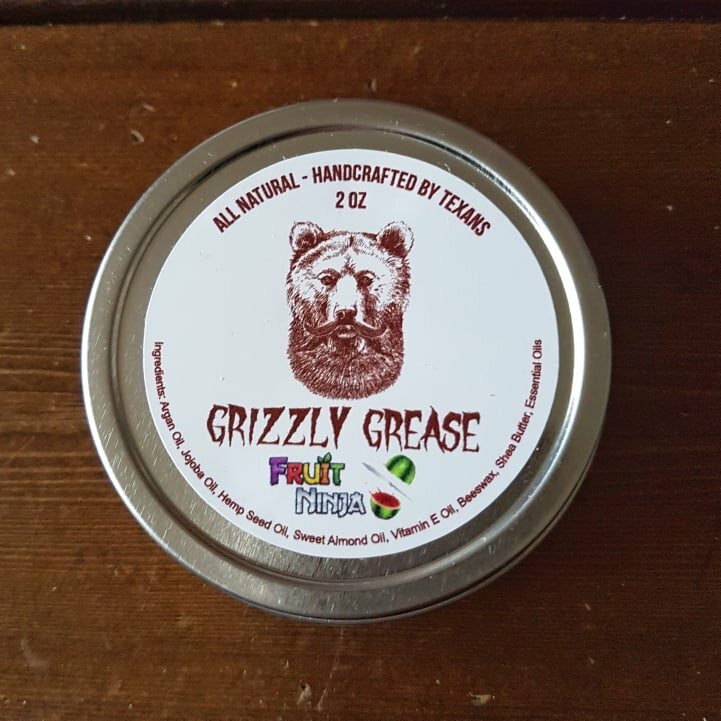 Grizzly Grease is an all female run beard care brand run in Texas, North America and they are very proud to be catering for the grooming needs of bearded men. I was sent the 2oz Fruit Ninja beard balm for review and the balm actually ties in very well with the brand name. It is a base blend of Argan Oil, Jojoba Oil, Hemp Seed Oil, Sweet Almond Oil, Vitamin E Oil, Beeswax & Shea Butter and the result is a consistency that is softer than the average balm and has a greasy like consistency. This might appeal to those of you who normally stick to an oil rather than a balm as it doesn’t offer as much of a hold due to it’s consistency. The Grizzly Grease Fruit Ninja balm left my beard feeling and looking quite good. When reviewing I don’t look at the ingredients before I use the product and I have to admit to thinking that the Fruit Ninja scent would be a blend of fragrance oils. However it is a blend of Bergamot, Mandarin, Cardamom & Sandalwood essential oils and a nice scent blend that is Citrus sweet with some warmth and the Cardamom has added a nice slight aromatic and spice to the sweetness. All in all it is a nice balm. The shame is that for us in the UK, purchasing from North America is a gamble and it means that most guys steer clear and that is a shame. Instead of recieving the balm, I had the loathed Royal Mail card in the post telling me that I had customs charges to pay and on top a Royal Mail admin fee that took it to just over £11. The UK has a low threshold for goods from the USA at around £15 and so one product means charges, but hopefully with our exit from the EU, we will have a better trade deal in place with America. The 2oz (59.1ml) Grizzly Grease Fruit Ninja comes in a screw top tin and costs $19.99 from the website.